Earthley’s Natural chest rub is a simple combination of essential oils for respiratory congestion as well as olive oil and candelilla wax to help your little one breathe more clearly! Free of fragrances, parabens, sulfates, and polysorbate 80. When Your Little One has the sniffles and You Just Want Them to Feel Better, Try our Breathe Well Salve! Every mother just wants her baby to feel better, especially when they are suffering from those middle of the night coughs, hacks, and sniffles, because when a little one is sick, what they need more than anything is a good night’s rest. However, that isn’t happening if the baby’s congested! Help relieve some of that congestion and promote more restful sleep with our unique combination of essential oils for chest colds including rosalina, lemon, balm mint bush, and clary sage, as well as olive oil, and candelilla wax. This natural vapor rub is safe for kids over a year old. Many other options contain eucalyptus or rosemary, which are not recommended for children under 10. Earthley’s essential oil chest rub is specifically formulated to be safe for the little ones! 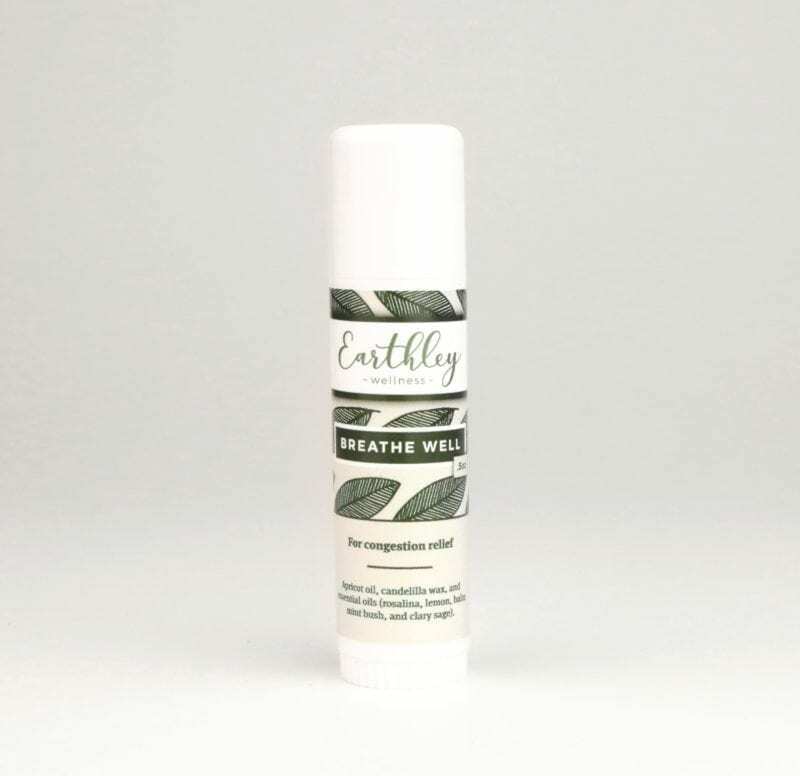 Our Breathe Well salve comes in an easy-to-apply 0.5-oz. tube. Simply rub a little bit of our natural vapor rub on your child’s chest or feet to help them breathe more clearly when they have the sniffles. It’s not messy, therefore this tube can travel easily in your purse or diaper bag! Rub a small amount of our blend of essential oils for chest cold on your chest or bottoms of feet before bed. Shelf Life: 1 year. No known contraindications with these oils while breastfeeding, or in children. Not safe to be used in pregnancy (until full term). Talk to a health professional if you have any concerns before use. We got this just in time for treating a cold. I put it on my boys’ sinuses at night to help them sleep. It takes a few applications throughout the day to keep things moving. I love this thing. It smells great and the cooling feeling is very nice when I am feeling under the weather or even when my allergies are acting up. I usually dab a little under my nose. This little stick is wonderful! Convenient size to carry with you and it works! A little under your nose works great! It’s also easy and mess free, making it great to use on the kiddos! Got this for my mom. She’s been sick all winter. After starting it she was finally able to sleep and it even decreased her wheezing. This is an awesome alternative to the popular breathe easy ruubs and creams. It smells great, works great, and I know it’s safe for my LO. When 2 of my favorite companies – Plant Therapy and Earthly – team up, you know it’s going to be good! I got exactly what I expected with this salve: great application, great smell, and great results! We’ve used this for allergies, as well as a few minor colds, and I’ve been pleased every time! It smells great, but I’ve not had a chance to use it yet for my kiddos haha! No sickness over here this year so far! My husband did try it to help with some seasonal allergy issues and loved it. When I had a cold I put this on just like I would of used Vick’s. Chest face nose. Works great. I gave my mom some and she loves it. I like it but I just wish that it was a bit stronger and lasted longer. I’ve found that it takes repeated applications to be really effective. I’ll still order this again though because I like the fact that it’s all natural and a much safer healthier option. I almost don’t know how to convey what this stuff means to me, but I will try. My son tends towards a croupy cough which developed into stridor twice. Very very scary. This together with cough b gone has changed our life. Depending on severity I will still use acetaminophen at night when he’s at higher risk, but these two products have reduced the need by quite a lot. I read in another review that a mother rubs a bit on her sons sinuses and so I began doing that too, works like a dream! I do agree with other reviewers, you do need to reapply after a few hours but its so easy to do that it can be done while they sleep. I also use Elderberry Elixir and that has reduced the frequency and severity of colds/coughs by quite a bit. I love having a safe option to use on my toddler, and she loves it too! Perfect for colds and congestion. This stuff is amazing. My kids have had a nasty chest cold, and this works so well for all of them, especially at bedtime. The youngest is too young for the other cough tincture, so we use this on him at night and it’s amazing! And it smells so good! I use this on my little ones, it’s worked amazingly and I love how I don’t have to worry about the safety of the ingredients. I cant say enough about this! My whole family has used this. It has stopped us from coughing almost instantly. My poor hubby had such a bad cough last week while sleeping. He couldnt stay asleep and he woke myself and my toddler a few times. After being annoyed with the coughing I went and grabbed this amazing stick. After applying the cough was pretty much nonexistent and we were all able to sleep the rest of the night. This stuff is AHHHMAZING! I simply love it. Very effective at opening up the airways when you’re congested and safe to use on little ones. Helped my boys sleep through the night when they were sick so it’s a win for me! My one suggestion is that Earthley needs to change up their labels because it’s easy to grab the wrong salve stick if you’re tired since all the labels are very similar. I use this on my kiddos all winter anytime they get a little stuffy. It really helps them breathe easier at night and they awaken much less often! It’s great! Used this on my son who was really congested for a few days. It always seemed to help clear him up and relieve some congestion. This works well! I put it right on the sinuses. You do need to reapply after a couple of hours. This stuff is amazing! While my son had a cold, I rubbed a bit on the bottom of his feet (sometimes a little on his back too) whenever he’d have a coughing fit and within minutes his cough was gone and his congestion was cleared up. I also love the light scent and the mess-free, easy to use tube.